Hi everyone! Hope your all staying nice and warm inside cause that snow is freezing outside. This is a scrap page I put together and am very pleased with how it came out. I Love the pink and brown combo...well just about anything and brown is a favorite for me. I used pink perouette (someday Ill learn how to spell it without looking), bella rose dsp, pink and brown ribbon and chocolate chip ink. Behind the picture is a tag that has the date that the picture was taken and whatnot--thats why the ribbon is up there. I didnt think to pull the tag out to show that thats what it was. 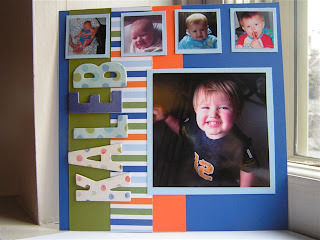 I am going to be having a FREE workshop on January 23rd where we will be making this page. If your not so into scrapbooking but need a night out, come anyways. 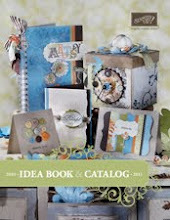 You will be able to check out the new catalog and see whats coming up for sale-a-bration. And besides, its free...what have you got to lose? Hope everyone had a fabulous Christmas! I did. The boys had a blast opening presents this year. It was very busy for us. We had a christmas eve party, then stayed at my inlaws for the night so the boys could just open all of their presents there. After presents we headed to my sister in laws for an early dinner and to open presents again. Then after that it was off to our aunts house for christmas with Grandma. It was a very busy long day. My boys were Exhausted. It was nice to see everyone for the holidays though. I gave the scrap book to my mother in law. I finished it just in time. She opened it christmas morning and before she even turned to the second page started crying. It was really sweet. Then everywhere we went that day she brought it with her to show it off. I had planned on posting some more pictures of it, but I didnt take any pictures before I gave it to her. Next time I see her Ill have to get some. well just wanted to let yas know she liked the scrapbook. I am working on some more stuff to share with yas soon. Have a great day! Hope everyone is having a fabulouse christmas today. It came sooo fast this year. So the story behind this scrapbook.... I am making it as a gift for my inlaws. 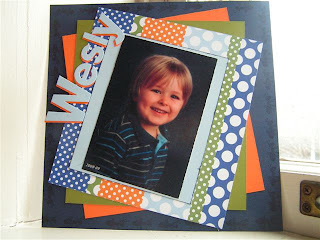 My mother in law has been saying how she would like a family scrapbook so I have been working on putting one together. All of the pages are very simple cause I decided at the last minute that I wanted to do this as a gift. I dont know if she checks out my blog or not--my guess would be no, but ya never know-- thats why I couldnt say it before. Well thanks for stoppin by. Enjoy your holidays! 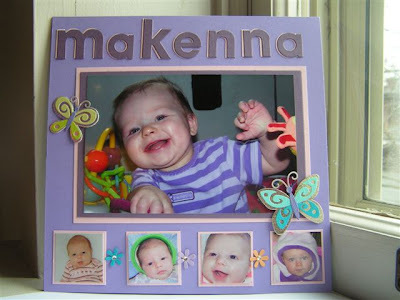 This is my gorgeous little neice Makenna. She is 10months and such a good baby. I love the main picture on this page and thought that since her shirt was purple, that the page should be purple as well. This is a very very simple page but I really love how it came out. I used 2 purples from the soft subtles family (I cant remember thier names and dont wanna go look) and Pink Pirouette. I had some jolees stickers layin around and thought they went well with the pictues I used so I through them on there for some quick embellishments, used the big shot for her name and VOILA! I was done. so thats page 3.... more to come in the next couple days. Stampin UP is has announced their new promotion. The promotion is called Love you Much bundle. It's a fantastic bundle of products at 20% off and if you purchase it today you can also get it with the FREE SHIPPING PROMOTION. But today is the last day you can get it with no shipping charges. 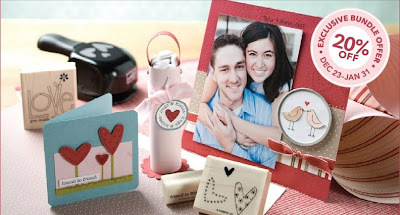 What a great way to get everything you need to make those valentines day cards. What makes it even more great is you can have it before the new catalog even comes out. To order this bundle you can either email or call me, or click on the link to the right that says online shopping. To view a larger version of the flyer just click on the picture above. But because Stampin UP is so generous they're offering the bundle at 20% off for only $41.48. This is another page of my other son kaleb. I cant believe Im actually getting a chance to post two days in a row! So this page uses old olive, only orange, brilliant blue (i think) and that DSP that retired and I cant remember the name of. I used chipboard that I had packed away (one of those Ill use this someday things) and after I had it all glued and finished I decided I really didnt like it but Im stuck with it. Every other page i have done for this scrapbook uses the same set of letters. oh well though. Ok my 5 minutes is up. Time to be a mom again. Have a GREAT day! Lookin at the picture it looks like its been pretty nice up here in New England... well look closer. 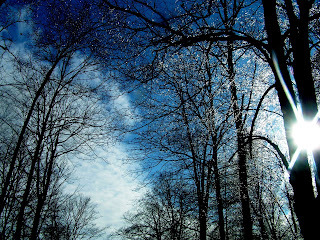 That was a picture from our ice storm last week. The picutre below show a better look at all the ice. Granted the town I live in didnt get it any where near as bad, but the surrounding towns did. They were without power for over a week. Now we are in the middle of a snowstorm. We got like a foot yesterday and its been snowin like crazy out all day today. Im not sure how much has accumulated but I know it is FREEEEEZIN out there! So enough about the weather. I havent posted in sooo long that I thought Id share a scrapbook page I did the other day. 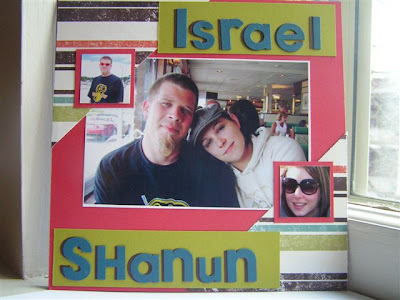 I havent scrapbooked in forever. Ive been workin on an 8x8 book and I cant say for what or who or anything like that cause its going to end up being a Christmas present if I finish it in time and ya never know whos checkin out the blog. Now I obviously didnt edit this picture or anything. It needs to be cropped and have the lighting ajusted but you get the picture. I actually changed the page just a tad since Ive taken this picture. i added a couple little photos across the bottom and a Cute as a Bug tag at the top. Its hard to see but around the sides of the blue cardstock I stamped little ants from the bugs and kisses set. I used night of navy, pumpkin pie,bashful blue, and wild wasabi cardstock and I dont recall the name of the DSP. It retired last catalog. I used the big shot to make the letters for his name and that was it. Its a Very simple page but I love how it looks. I think it matches perfectly with my sons Preschool picture. Well thats all for now. I have to start makin some cookies for Wes to bring to school tomorrow. Hopefully I will post another page tomorrow. Dont hold me on it though. Have a great warm and safe day! ITS HERE! 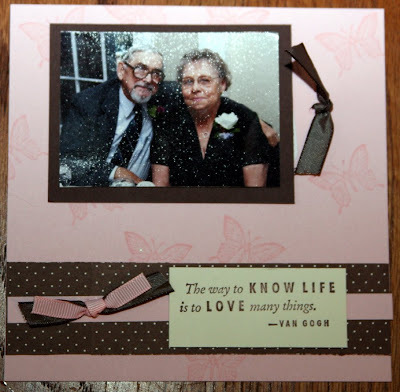 The retired list is up and Stampin UP is making it extra special! From now until the 23rd you will receive 10% off of any of the retired sets you order. On top of that..... For any purchases over $70 you will receive free shipping! It doesnt get much better than that! Get all those favorites youve been wanting before its too late and save a bundle when doing it. 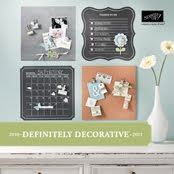 To see the rettired list click on the guy up above (shows the 10% discount) or the link to the right or visit my website www.laurafiske.stampinup.net . 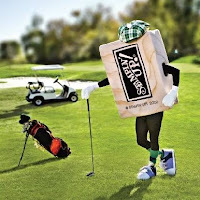 You can shop right through there...save shipping, 10%, and gas or postage and you can do it in your jammies any time! Your order will be shipped directly to you. Talk about a great deal! Order before the 16th and your package should arrive before Christmas (no guarantees though).